In this tutorial, you'll learn how to make your augmented reality app for iPads and iPhones by using ARKit. Specifically, we'll go over how we can play a video on a 3D TV in ARKit. We'll be learning how to play a video on a 2D plane using Scene Kit and Sprite Kit inside of ARKit. Mac running macOS 10.13.2 or later. A device with iOS 11+ on an A9 or higher processor. Basically, the iPhone 6S and up, the iPad Pro (9.7-inch, 10.5-inch, or 12.9-inch; first-generation and second-generation), and the 2017 iPad or later. Swift 4.0. Although Swift 3.2 will work on Xcode 9.4, I strongly recommend downloading the latest Xcode to stay up to date. 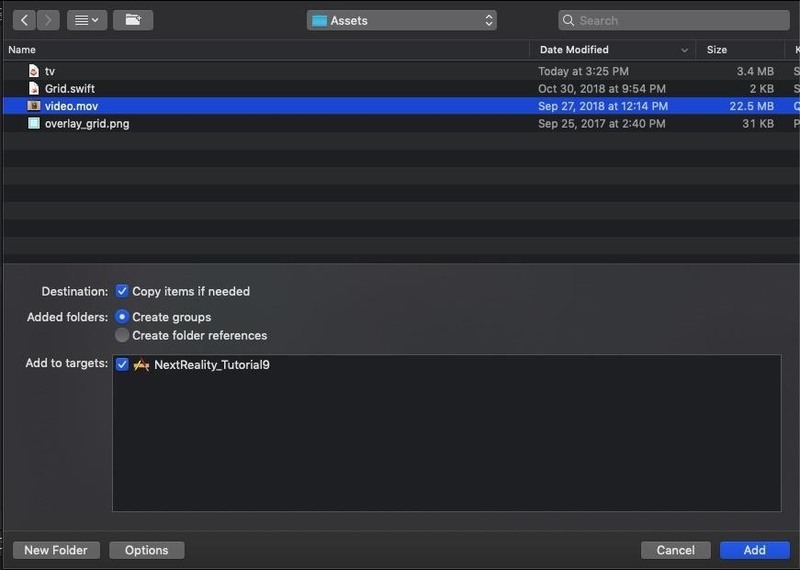 To make it easier to follow along with this tutorial, I've created a folder with the required 2D assets and Swift file needed for the project. These files will make sure you won't get lost in this guide, so download the zipped folder containing the assets and unzip it. If you're not sure how to do this, follow Step 2 in our post on piloting a 3D plane using hitTest to set up your AR project in Xcode. 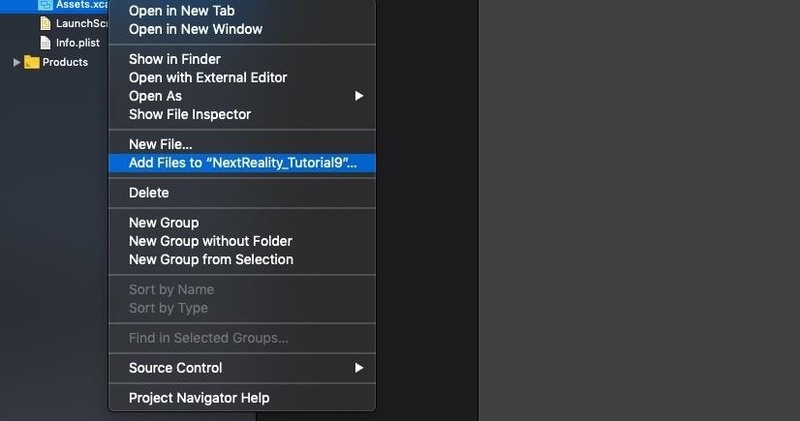 Be sure to give your project a different name, such as NextReality_Tutorial9. Be sure to do a quick test run before continuing on with the tutorial below. In the project navigator, click on the "Assets.xcassets" folder. We'll be adding our 2D images there. Then, right-click on the left pane of the area in the right side of the project navigator. Choose "Import" and add the "overlay_grid.png" from the unzipped Assets folder. Then, right-click on the "art.scnassets" folder, which is where you will keep your 3D SceneKit format files. Afterwards, select the "Add Files to 'art.scnassets'" option. Then, add the "tv.dae" file from the unzipped "Assets" folder you downloaded in Step 1 above. 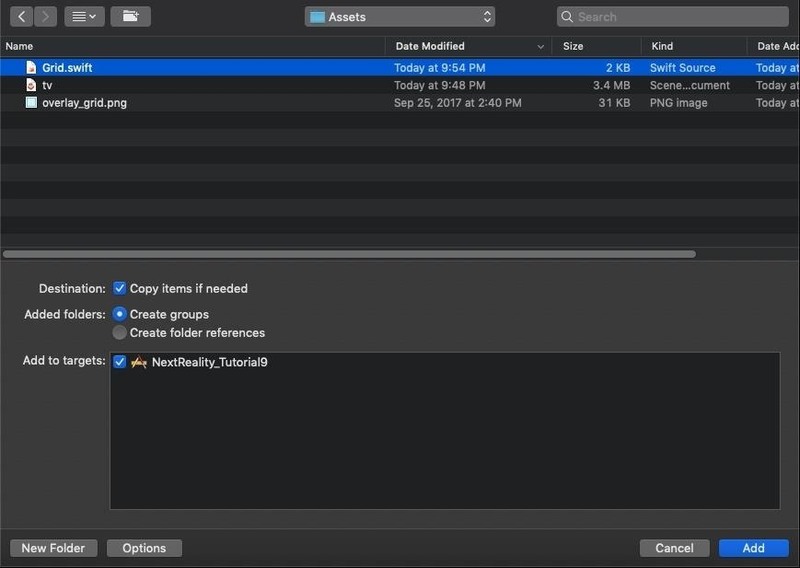 Next, once again in the project navigator, right-click on the yellow folder for "NextReality_Tutorial9" (or whatever you named your project). 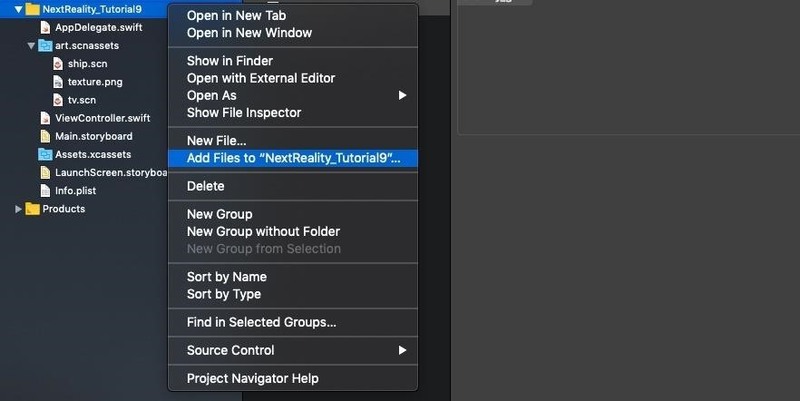 Then, choose the "Add Files to 'NextReality_Tutorial9" option. Next, navigate to the unzipped "Assets" folder, and choose the "Grid.swift" file. Be sure to check "Copy items if needed" option and leave everything else as is. Then, click on "Add." This file will help render an image of a grid for every vertical plane ARKit detects. To quickly go over ARKit's plane detection capabilities, take a look at our tutorial on horizontal plane detection. Open the "ViewController.swift" class by double-clicking it. If you want to follow along with the final Step 4 code, just open that link to see it on GitHub. Copy and paste the following two methods as listed below to the end of the file before the last curly bracket ( } ) in the file. 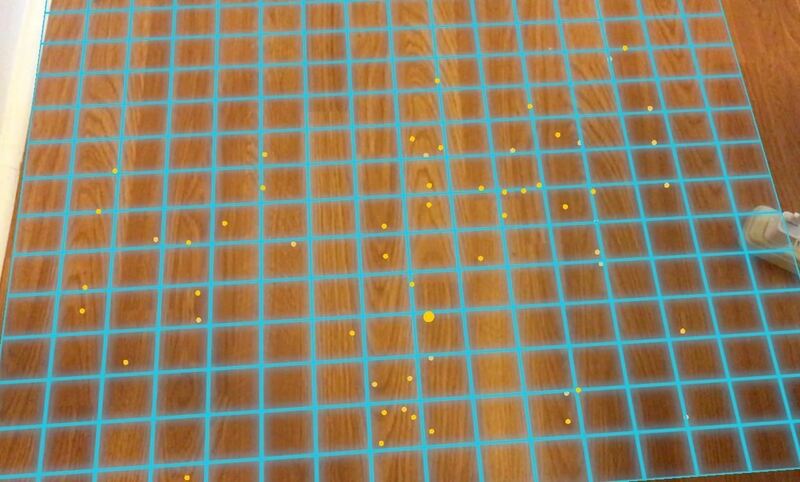 These methods will allow us to add our Grid on the vertical planes detected by ARKit as a visual indicator. The didAdd() is called whenever a new node is added to the ARSCNView. Here, we add the grid image we imported to any plane detected. The didUpdate() is called whenever newer ARPlaneAnchor nodes are detected, or when the plane is expanded. In that case, we want to update and expand our grid as well. We do that here by calling update() on that specific Grid. This is very important! It will ensure that ARKit is able to detect horizontal planes in the real world. The feature points will allow us to see all the 3D points ARKit is able to detect. 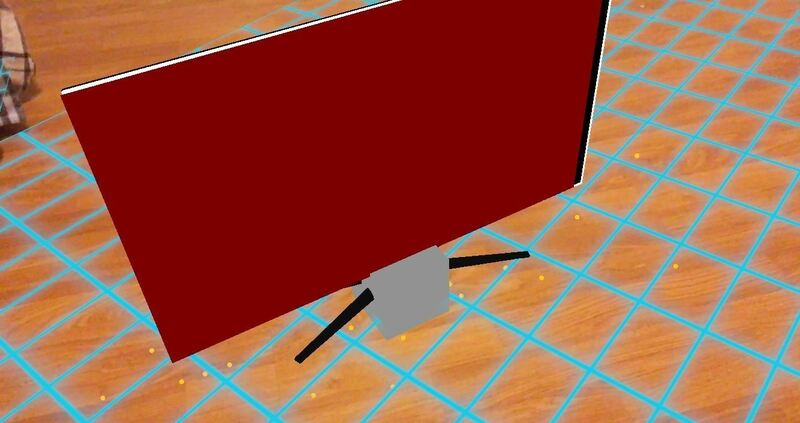 Next, let's add gesture recognizers, which will allow us to detect where to place the TV. Now, let's add the tapped(), which converts the 2D coordinate from the tapped location on our phones into a 3D coordinate using the hitTest . let scene = SCNScene(named: "art.scnassets/tv.scn")! Checkpoint: Your entire project at the conclusion of this step should look like the final Step 4 code on my GitHub. What's cooler than watching a video on phones? Watching a video in augmented reality on our phones! If you remember from our last tutorial, we placed the Mona Lisa on a wall. Let's use that same video from that tutorial and play it on our 3D TV. Next, let's go back to our addTV() method. Here, we'll import our video into a SKVideoNode and attach it to Scene Kit scene. We'll then set the correct size of this scene and attach it to our existing SCNNode TV Node. This makes sure that our video scene is attached to our TV. Then, we'll play the video. Checkpoint: Your entire project at the conclusion of this step should look like the final Step 5 code on my GitHub. Success! Using the steps above, we were able to place a 3D TV in augmented reality and play a video on it using ARKit. Imagine the future implications of this kind of AR dynamic. Eventually, when AR glasses are mainstream, we're all going to be able to watch TV on very large screens anywhere. This is already possible with devices like the HoloLens and the Magic Leap One, and now we've done it using ARKit right on our phones. Now try experimenting by taking things to the next level and including your own videos onto the 3D TV. If you need the full code for this project, you can find it in my GitHub repo. I hope you enjoyed this tutorial on ARKit. If you have any comments or feedback, please feel free to leave them in the comments section. Happy coding!